1. New weekend, new museum. My friend and me half-accidentally landed to Museum Berggruen (actually we were on our way to Sammlung Scharf-Gerstenberg) where the Matisse and Picasso exhibitions were excellent. I definitely need to go there again, next time with the audioguide. Even though I love “just seeing” the pieces of art, I think I lack most of the experience when I do not really know the background of them. I am hesitating between a guided tour and audioguided tour, but one of those needs to be done. With a quick glance Sammlung Scharf-Gerstenberg seemed also so good, that it is definitely worth a visit even to the far west. Why I haven’t realized before that the traditional, interesting art museums are located to Charlottenburg? 2. New weekend, new café, now TassenKuchen. This was not a third wave coffee place, more a vegan-american-bakery, so I went for white tea. 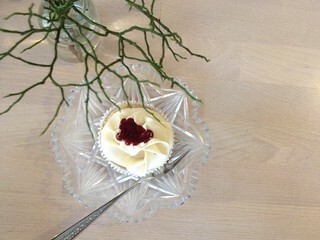 I can still admit that the cupcakes looked lovely. This all in hipstery since last ten years up and coming Wedding with Mitte-prices. Not 100% what I like but I give extra + for the friendly service and suprisingly nice selection of magazines though. The skipped cupcake, looking all instagrammy. 3. Wedding Türkisch Veggie Market, 4 pm, time for real bargains. This week… Well, I bought one huge plastic bag of sweet potatoes for two euros. Yes, 2 €. Until now: I traded some of them for blueberries (there is a reason you should always go with a friend to the veggie market), made sweet potato soup, made sweet-potato-raw-chocolate mousse, sweet potato muffins (recepies coming up), had sweet potatoes with my evening chicken and I am planning some fish and sweet potato lunch boxes. At the moment I still have more than half of the potatoes non-used. Let me know if you have creative ides. 4. Morning run. 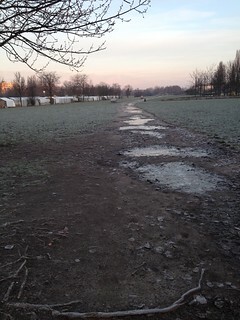 Uh, you know why morning runs in Berlin are the best: You can have the whole city just for yourself. 5. The best brunch place in Berlin? My home with my friends! 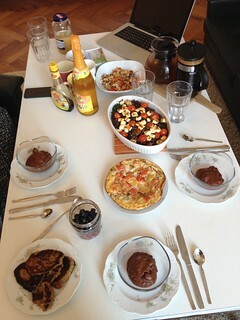 Pancakes, egg dishes, lentil-feta salad and the sweet potato-chocolate mousse and as much coffee and tea as we wished for, all healthy without any feeling of should-leave-soon-as-there-are-people-coming-and-going-all-the-time. 6. Keeping up with the pilates & yoga resolution: Saturday Yogates at McFit, Sunday Hot Yoga at Bikram-Yoga Berlin Mitte. 7. 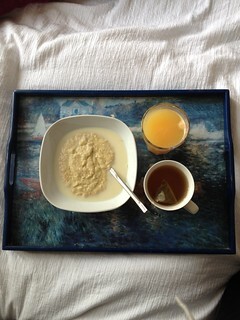 Not-so-secret-any-more unclassy habit, eating morning porridge in bed when sun is shining.